Various nasal and paranasal sinuses malignancies comprise approximately 15% of upper aerodigestive tract neoplasms. Chronic exposure to metals like nickel and chromium, and a variety of organic chemicals used in manufacturing greatly increase the risk of developing nose cancer. Early nasal cavity cancer can produce symptoms that are very similar to less serious nasal diseases such as swelling of the sinuses, headache, chronic infections, and/or blurred vision. In addition to the malignancies described above, this book examines three types of malignancies, which are not unique but are quite rare in the nasal region - lymphoepithiliomas, primary non-Hodgkin lymphomas and mixed tumours. Furthermore, viral cancers have been linked to approximately 15-20% of all human tumours world-wide. 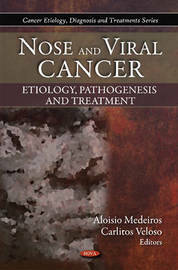 This new book gathers the latest research from around the globe on these cancer profiles and related topics such as nasopharyngeal carcinoma, malignant sinonasal tumours, the aetiology, pathogenesis and prevention of cervicouterine cancer (CCU) and oesophageal cancer, nasal reconstruction after nose cancer, and an innovative approach to cervical cancer prevention.